Is Google cracking down on sites that aren’t mobile-friendly? Home/Restaurant Industry/News/Is Google cracking down on sites that aren’t mobile-friendly? Google is not out to get your website. They are, however, out to improve user experience for their – and your – visitors. It’s what we’ve learned over the past five years of Google’s algorithm changes: Panda, Penguin, Hummingbird and Pigeon. We could start a bizarre zoo with the collection of updates and algorithms. Each Google algorithm change was released to improve one thing: user experience online. And as search engine use has gone from desktops to laptops, then from laptops to tablets and smartphones, Google has been nudging websites in that direction as well. 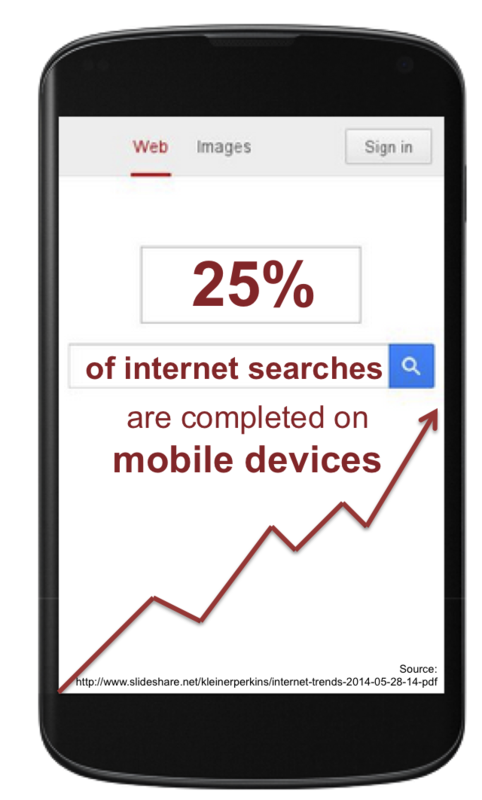 25% of internet searches are now completed on mobile devices. Google is adapting – are you? It started with conversational search queries popularized by Siri and Google Now, which started auto-populating in written search bars. Google Analytics then began displaying device data to give webmasters a better idea of how their visitors were viewing sites. Recently, Google launched a mobile-friendly testing tool and started labeling mobile-friendly sites in search results. If those weren’t strong enough indicators that Google knows its users are increasingly mobile (and your site should be, too), they’ve recently started sending notifications to webmasters whose sites are not mobile-friendly, letting them know that those errors will impact how sites are “displayed and ranked” for smartphone users. Is there another penalty looming? We’ll see. But if this is already impacting how sites are displayed and ranked, it’s at least clear that Google is rewarding sites that play by the (unwritten) mobile rules. Small businesses can get their information out on a mobile-friendly page without investing in an entirely new site by using a service like SinglePlatform. For more information and examples of how we can improve your customer’s mobile experience, contact us.